DUST: Improving or impairing vision; gradual destruction, disassembly, and reconstruction; fine manipulation; sleep and stasis. LIGHTNING: Control over electricity; teleportation; improving speed or reflexes; light sources. MIST: Illusions and misdirection; hypnosis; stealth and invisibility; telepathy; mental manipulation. WOOD: Plant life manipulation; construction. ROCK: Control over rocks, minerals, and ores/metal; defensive shields, barriers, and protection; reflection/deflection; ink for message scrolls. STORM: Heavy offensive spells; enhancing weaponry; cutting and slicing techniques; combining offensive and defensive capabilities. DESTRUCTION: Injury, sickness, and death; immediate destruction; blood magic and ritual summoning. 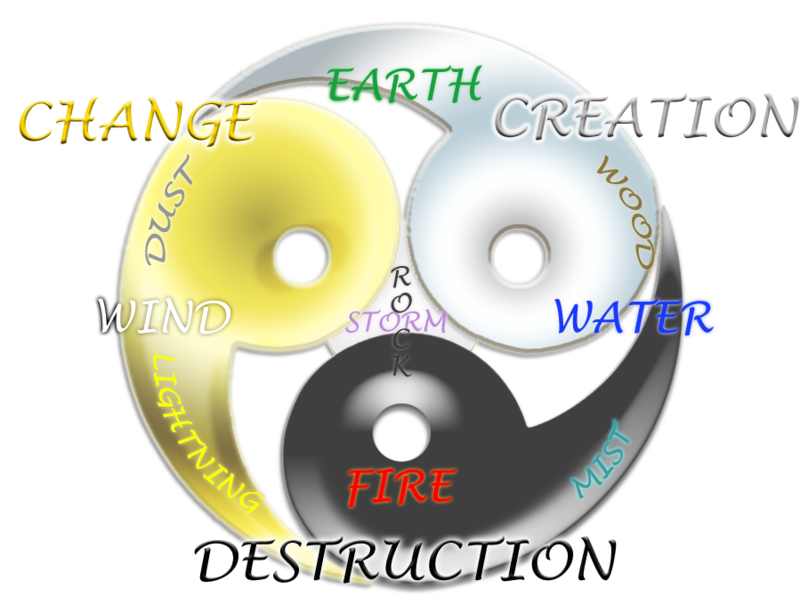 “As you can see, the four basic elemental forces form the core of nearly all spells. One core element can be combined with any other except itself to create one of the six sub-elements. Three additional elements which encompass and overlap with all the others exist outside the chart, due to their association with the Gods. Only the most powerful and skilled of mages can learn Creation, Change, or Destruction spells; some sentients have spent their entire lifetimes attempting to master even one of these. “For the most part, mages are born, not made… an ordinary sentient can be taught, but the process can take years if not decades. Evidence of an aptitude for magic will usually present itself when the sentient comes in contact with a focusing object; that is, an object which helps to channel and regulate the user’s power. This contact will usually reveal which style of magic the potential mage is most suited for. From there, a mage may specialize in that style, or attempt to learn others to compliment it. Only a handful of mages in history have ever achieved mastery in more than two styles, however. “Be warned, reader. Though curiosity is always understandable, knowledge of any magic can be a dangerous thing. To cast spells is to do no less than affect the natural order of the world… it is entirely understandable why the squirrels prohibit its usage. Any study of magic must be undertaken with great care and caution, if the caster should have any hope of surviving long enough to truly earn the title of Mage.